Do you want to rent a 4×4 with a price that starts from 50 euro/day with all the features included? 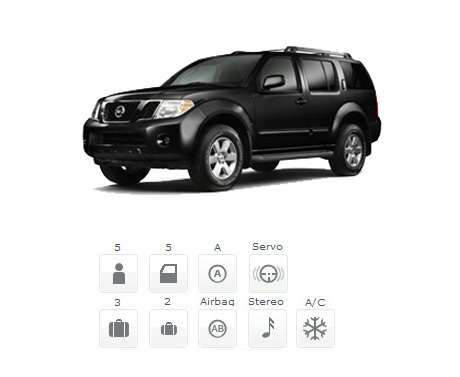 FocusRent, one of the best car rentals companies in Bucharest and Otopeni, offers you Nissan Pathfinder! We offer you for rental a safe 4×4 car with sufficient space for passengers and luggage. In addition, at FocusRent, our loyal customers benefit of a 10% discount, a full gas tank, full CASCO and RCA insurance included and no kilometers limit. Nissan Pathfinder is one of the most appreciated vehicles in our car rental offer, which our customers prefer when they want to drive safely. Its safety features are premium, which encourages our customers even more to choose it for their vacation trips. With an impressive acceleration, a low fuel consumption and an astonishing interior design, Nissan Pathfinder offers you the most comfortable driving experience. It is a car equipped with the most innovative technology, designed to offer you the most pleasant experience. We are here for you 24/7, whenever you need car rental services in Bucharest or Otopeni, on our website, by filling the online booking form, as well as at our phone number (+4)0735-05-7777. Call now and book the car you need to rent!